Conventional Cough Medicines Are Filled With Harmful Chemicals - Here’s Why You Should Try Using Pineapple Juice! Conventional Cough Medicines Are Filled With Harmful Chemicals – Here’s Why You Should Try Using Pineapple Juice! One glass pineapple juice also contains nearly half the amount of vitamin C that you require per day. Vitamin C is essential because as well as many other uses, it also enables your body to metabolize certain vital enzymes that regulate your metabolism and manage energy. In addition to containing Bromelain and vitamin C, pineapple juice is also a good source of the mineral, manganese, which helps your body to maximize its absorption of calcium, aids the metabolization of carbohydrates and fats into energy, as well as facilitating healthy nerve function. It is also assumed that a certain amount of the Bromelain in pineapple juice is absorbed by the body directly, and that it works to lessen inflammation helping to relieve conditions like arthritis. In Germany, Bromelain is specifically approved for treating inflammation and swelling of the nose, typically post sinus surgery. Why not juice your own? 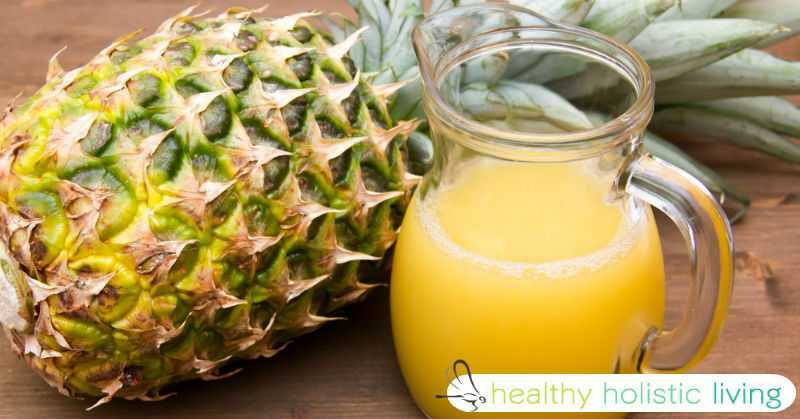 Some pineapple juice that is on sale can include added sugar, so if you are watching your diet, and managing your weight, it’s best to go for the natural unsweetened variety which you’ll find on sale in most good supermarkets. Better still, and great for any holistic health lifestyle lovers, if you got a juicer in the house, why not buy fresh pineapples and make your own juice? Here’s a recipe to help you to knock together your own wholly natural pineapple juice cough mixture. Add all the ingredients to your juicer, and blitz! Your mucus and your cough will be gone in no time.